Few things in life are better than a plate of raw oysters on the half-shell. I spent a lot of my younger days in coastal environments, and I have shucked and eaten thousands of oysters. You might think that there would be little involved in opening the shell of a creature that can’t bite, claw, or swim away. You would be wrong. Oysters are a tough nut to crack. Oyster knives are one of the most neglected and least understood tools in the cutlery world. And, there are lot of oyster knives on the market that are close to useless for any serious shucking. 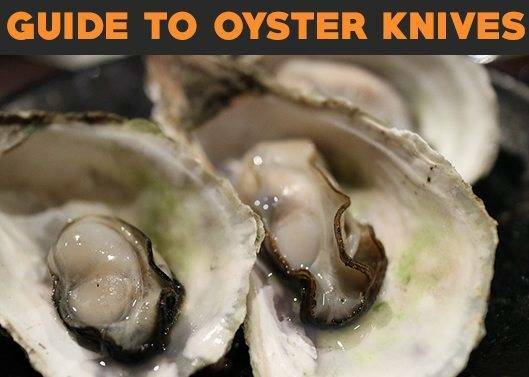 In this article, I’ll walk you through the process of finding the right oyster knife, as well as giving some tips on shucking, and a review or two. Eastern, or American Oyster – a medium to large sized oyster once common along the eastern coast of the US from the Gulf of St. Lawrence, all the way around to the Gulf of Mexico. This was once the main oyster harvested in the US, but over-harvesting, destruction of habitat from dredging, and disease have decimated them to only around 1% of their historical population. Efforts are underway to re-establish previous population levels through aquaculture, and commercial oyster-farming. They have sweet-tasting meat, but are on of the more difficult species to shuck. Edible, or European Flat Oyster – Native to the waters of Western Europe from Norway to the Mediterranean, Edible Oysters have been introduced to the Eastern United States, and Northern Pacific Coasts for use in commercial oyster farms. This is a smaller oyster with a very sweet taste, and is easier to shuck than the American Oyster. Pacific Oyster – native to the coasts of the Asian Pacific Ocean, the Pacific Oyster has been introduced from Japan to the rest of the world for commercial farming, to try and bolster the declining native populations. This is a large, fast growing species, and can grow to over 12”. It has a great taste and texture, and is right about in the middle as to the ease of shucking. The Pacific Oyster has become the most commonly farmed oyster in the world, and if you order oysters in a restaurant, buy them in a supermarket, or canned, these are most likely what you are getting. Shucking oysters is not as bad as it sounds, if you use the proper techniques. The idea is to have the oyster, intact, and loose from the adductor muscles, sitting in its own juice in the bottom shell. There should be no grit or fractured shell pieces in the oyster. The reason you want the oyster like this is because the proper way to eat an oyster on the half-shell is to drop a little sauce of your choice onto it, pick up the entire shell, raise it to your lips, much as you would champagne sipped from a woman’s shoe (well, I have heard of people doing that…. ), pointed end towards you, and ‘slurp’ the entire oyster from its shell into your mouth, reveling in the wonderful tastes and textures that ensue. With a little practice, a good oyster-person can do several oysters per minute. Only use live oysters that are ice-cold. Frozen oysters should be avoided, because you cannot check their condition, and the flavor had been destroyed by freezing. Save frozen oysters for oyster stew. Never serve a dead oyster to be eaten raw, because they are not safe to eat. Check your oysters carefully. If any are open, they are probably dead. Tap on them, and if they close, then they are OK. Otherwise, pitch them in the trash bin. They should have a fresh sea smell to them, and have a little weight. If they feel light, or smell strong, pitch them. Make sure all the keepers stay on ice at all times. Get your gear together. Always wear mesh gloves, unless you like going to the Emergency Room with cut up hands. Oyster knives may seem dull, but you will be exerting considerable pressure on them, and a slip can result in a serious wound in your hand. Also, the shells themselves can have sharp edges. In pre-historic times, they were used as cutting tools. Next, you need a good oyster knife (more on that shortly…), a stiff bristle brush, a tray with a bed of ice to set the oysters in, and at least one or more towels. Start by brushing and rinsing the shell under running cold fresh water to remove any sand or grit that may get into the oyster when you open it. Then, grasp an oyster in your hand with the top shell on top, and the pointed end facing you. This is the hinge end. Once you start to open the oyster, never tilt it, or flip it on its side. You don’t want to loose the wonderful juices inside. Work the oyster knife into the hinge, or right next to it, with a side-to-side rocking motion. Once you are in, apply a twisting motion to separate the joint. You will feel a ‘pop’ when the hinge is defeated. Slide your knife around the edge of the shell, all the way around, until both halves are free. Be firm, but gentle, because you do not want to chip the edge of the shell and get pieces of it in the oyster. You also want to be careful not to damage the oyster inside. Again, never turn the oyster on its side, or allow it to tilt from the horizontal, because you do not want to spill the juice. It stays with the oyster. The adductor muscle. Slide your knife along the inside surface of the top shell until you find the adductor muscle where it is attached to the top shell, and sever it. Separate the shell halves, being careful not to spill the juice. Free any parts that are still attached with the oyster knife. The other adductor muscle. 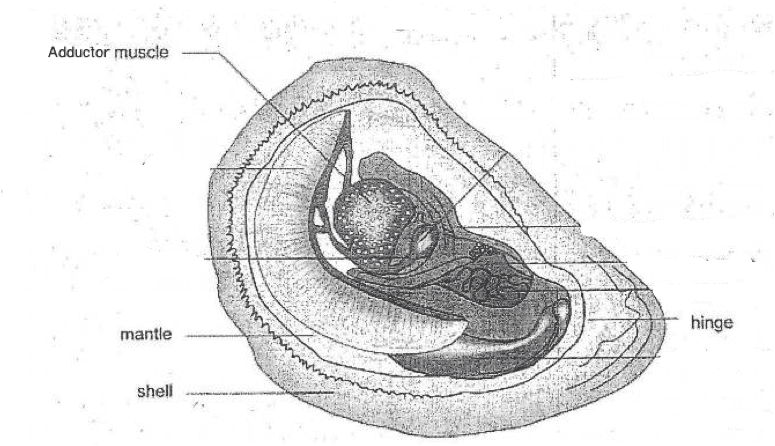 Slide the oyster knife along the inside surface of the bottom shell, find the other adductor muscle, and sever it, so that the oyster is just sitting free in the shell. Repeat. Place the oyster on an ice-bed, grab another one and repeat all the steps. Since we don’t need a super-sharp cutting edge, stainless steel is the way to go. 420hc is perfect. 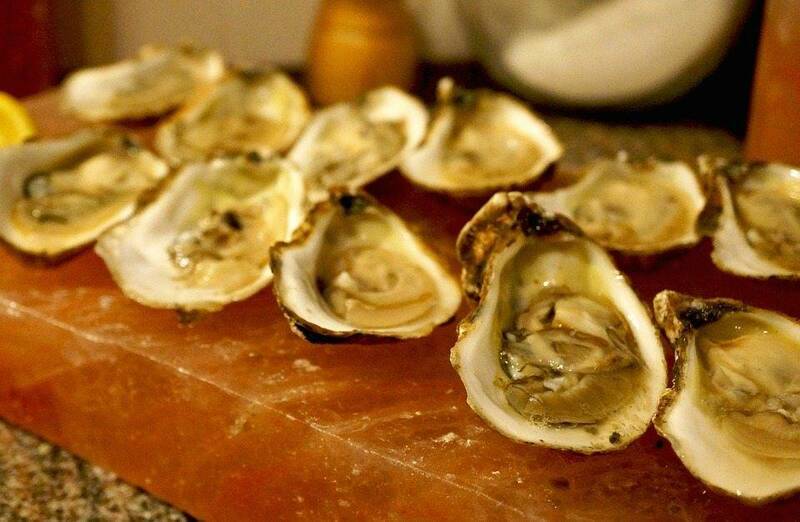 Oysters have a lot of natural salt in them that is very corrosive on metal. 420hc is one of the most corrosion resistant stainless steels out there, which is why it is used so much in professional kitchen knives. The blade needs to be short, no more than 3” tops. Longer blades will bend, and/or snap when you apply lateral pressure to them. It needs to have an upturned tip, also called a New Haven Tip, to make it easier to work into the hinge, and aid in prying shells apart. Straight, or Boston Tip knives are used by professional shuckers in canneries, because the oysters will be cut into pieces, cooked, and canned, so they don’t care if they tear the meat up. They are more concerned with speed, rather than finesse. This may be one of the most important features. The handle needs to be big enough, and ergonomic enough for you to maintain a good grip on it while wearing mesh gloves and applying considerable pressure on it. The entire knife needs to be light enough for you to use in comfort for extended times. because sometimes you may be shucking oysters for hours at a time. As you can see, a good oyster knife is pretty low-tech, and even an expensive oyster knife will cost under $30.00. One good way to start your search for the best oyster knife is to go to a restaurant, or oyster bar that serves oysters on the half-shell, and talk to the people who actually shuck the oysters. They will be able to suggest some good models. See what they are using. That’s really all there is to it. A good oyster knife can make shucking oysters fun, instead of tedious. Try to get the best one you can find. This is the knife I use, and have used for several decades, both in restaurants, and at home. R. Murphy has been a leader in professional kitchen and food processing cutlery since 1859. This model has been in continuous production for over 100 years, and is absolutely a preferred model for professionals. You will see this knife in some of the most famous oyster bars and seafood restaurants in the country. Made in the USA, it has a 2-5/8” 420hc blade with a slightly upturned and pointed tip that pops through hinges like a squirrel cracks nuts. The upturned tip is to makes it easy to cut though adductor muscles without damaging the main oyster. It has a perfectly shaped wood handle that provides plenty of leverage, even for tough Gulf Oysters. In my opinion, this is the finest oyster knife available at any price…which is why I have one. This is another oyster knife that you will see in a lot of restaurants and oyster bars, and is also a preferred model among professionals. It has a very stiff 2-3/4” DEXSTEEL blade with an upturned pointed tip that goes through hinges very easily. The blade does not flex, making it easy to work around the shell edges without any chipping, and the wood handle feels like an extension of your hand. At a mere 4 oz., you can use this all day with no undue fatigue. Made in Thiers, France, for the money, this is not a bad oyster knife. With a stubby 1-3/4” 420hc blade, it makes short work out of most oysters, especially small to medium-sized ones. The ergonomic poly handle gives a secure grip. The only down-side is that on larger oysters, due to the shorter blade, it is easy to chip the shell, so extra care must be exercised on Pacific Oysters with this model. It is a bit heavier than the R. Murphy because of the poly handles, but still light enough for all-day use.